Specialists in fire safety have been saying it for years – the key to protecting your business from a fire is to focus on fire prevention. Here are the statistics you might not know about fire prevention and its effectiveness. 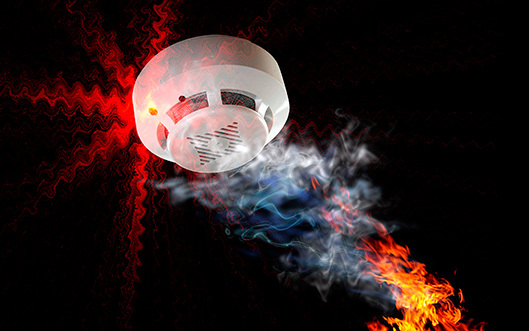 Did you know that having smoke detectors installed in your office statistically reduces your fire death chance by over 50%? That means you or co-worker is twice as likely to die from a office-based blaze if you don’t have smoke alarms. Additionally, nearly a third of fatal fires did not have a smoke alarm installed. In order to ensure your workplace has adequate fire protection, you’ll need smoke alarms installed on each and every floor of your building. Fire protection is fire prevention, and the easiest way to prevent a fire is by clearing clutter from around hazards items and areas in the work area. A great deal of fires have been traced back to a stray cinder from a candle or cigarette landing on a stack of newspaper or a pile of clothes. Just like that, a fire can spring up, unannounced and unexpected. Be sure to keep anything flammable away from anything that has an open flame (such as an incense), or anything that heats up (such as a space heater or the oil heaters). Many fires have sprung up from an oven mitt getting too close to the top of the stove – flames can easily leap from object to object, and get out of control before anyone is even aware of them. Old, worn electrical outlets are often a fire waiting to happen. Most electrical fires begin from an outdated or worn down power outlet that was still in use. Worn out power outlets can spark, and even emit a flame directly from the outlet itself. If your building has old outlets, replace them as soon as possible. The second most frequent cause of an electrical fire is old and worn of appliances still being used on a consistent basis. These tired old objects are worn down past their usefulness, and are a fire hazard due to the wear-and-tear on their circuitry and wiring. Replace old appliances as frequently as possible, as soon as you notice that the object is no longer functioning as it should. Don’t take our word for it – talk to any firefighter about the best way to fight a fire, and they will agree that it starts with fire prevention. Efforts that are poured directly into preventative fire techniques and methods pay off, by saving both property and lives. Many fire stations dedicate hundreds of hours into education programs for the public, teaching them how to prevent fires in their own homes. You can trust a firefighter to know the best way to deal with a fire, and that’s by making sure it doesn’t happen in the first place!